When I am working with my options trading coaching clients I often refer to standard deviation somewhat casually. I assume everyone understands the concept and especially how it relates to selling volatility (premium) on options. More specifically those options that meet my criteria for premium selling. There seems to be a lot of confusion surrounding the term standard deviation. To some readers it may sound like a very complicated math term. Maybe they heard of it but slept through their Statistics 101 class in college and can’t recall what standard deviation is. Whatever the case I will try to simplify it for you, it really is quite simple. 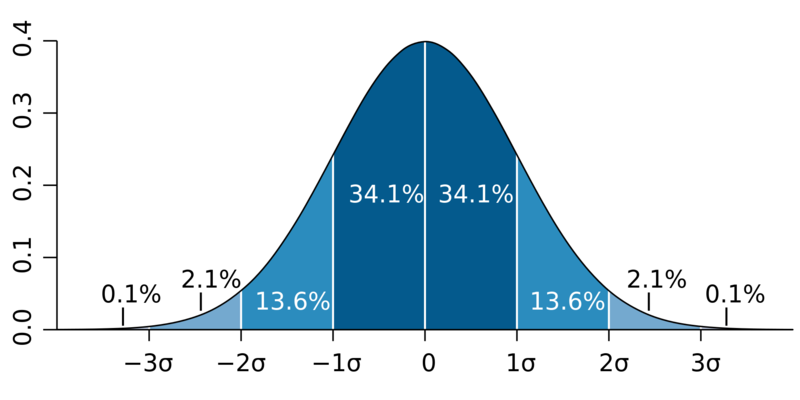 I have included a bell curve illustration at the bottom of this article to provide a visual representation. In volatility selling we use standard deviation to establish parameters for the strike prices we want to sell. Wikipedia defines standard deviation as “is a measure that is used to quantify the amount of variation or dispersion of a set of data values.” In laymen terms it simply means how far the numbers spread out over a defined period time. Implied volatility, time (as defined by days to expiration), risk free rate of return and the price of the underlying instrument are the primary drivers in determing the standard deviaton for a specific time frame. In the options trading world implied volatility predicts the one standard deviation range on an underlying instrument (stock, ETF or future) for one year. If an underying is trading for $100.00 and has an implied volatility of 20.00% then the expected one standard deviation range is plus or minus $20.00 ($100.00 x 20%) over the next year. Therefore, a one standard deviation calculation would predict a range ifrom $80 to $120 over the next year. A two standard deviation move would be $40.00 and the one year range would be expected to be between $60 and $140. Of course most of the trades that I take are materially less than one year. So how do we determine the expected one standard deviation for shorter periods of time? It is not important to memorize the formula but implied volatility plays a very important role. It is a known fact that a year is 365 days. The options market is not open on weekends and holidays so many traders use 256 days as the number of trading days in a year. I chose to use 256 days because the square root of 256 is 16 which is a whole number. You can use 365 days also and you will not see a material difference. My only suggestion is that you remain consistent. If the implied volatility is 20% and we calculate the square root of 256 days as 16 then the one day expected percentage move is 1.25% (20%/16 = 1.25). The one standard deviation move for one day is the price of the underlying instrument ($100.00) times the daily expected move of 1.25% or $1.25. Now we know that the one day range for this $100.00 underlying is from $98.75 to $101.25. You do not have to be a math savant to figure out any of this. Most option trading platforms display this information right on the options chain. Also, there are probability calculators easily found on the internet or you can visit my website www.optionsmeister.com where I have a simple one you can use. Ok you say I got the calculation part I still have no clue why I care about standard deviation. Let me help with that. A one standard deviation move is expected to contain the range of the underlying 68.2% of the time. A two standard deviation move is expected to contain the range of the underlying 95.4% of the time and a three standard deviation move 99.6% of the time. If we take this information and use the numbers we calculated on the $100.00 underlying instrument referenced above then we can project that about 2 out of 3 times (68.2%) this instrument will stay between $80 and $120. About 95 out of 100 times (95.4%) a two standard deviation range will contain the expected move. In our example this is would be a range from $60.00 to $140.00. This chart is courtesy of Wikipedia.